Supporters, World Leaders Celebrate Suu Kyi's Release The Nobel Peace Prize laureate appeared at the gate to her home, smiling and dressed in a traditional Burmese jacket. "There is a time to be quiet and a time to talk," she told hundreds of cheering supporters. Now 65, she was under house arrest for 7 1/2 years. Several thousand jubilant supporters streamed to the residence of democracy leader Aung San Suu Kyi as Myanmar's military government freed its archrival after years of house arrest. Suu Kyi appeared at the gate to her Yangon home, smiling and dressed in a traditional Burmese jacket. "There is a time to be quiet and a time to talk," she told her cheering supporters. "People must work in unison; only then can we achieve our goal." Earlier on, officials read the 65-year-old Nobel Peace Prize laureate her release notice. Her supporters surged forward after riot police stationed in the area left the scene and a barbed-wire barricade near her residence was removed. Suu Kyi, whose latest period of detention spanned 7 1/2 years, has come to symbolize the struggle for democracy in the Southeast Asian nation ruled by the military since 1962. 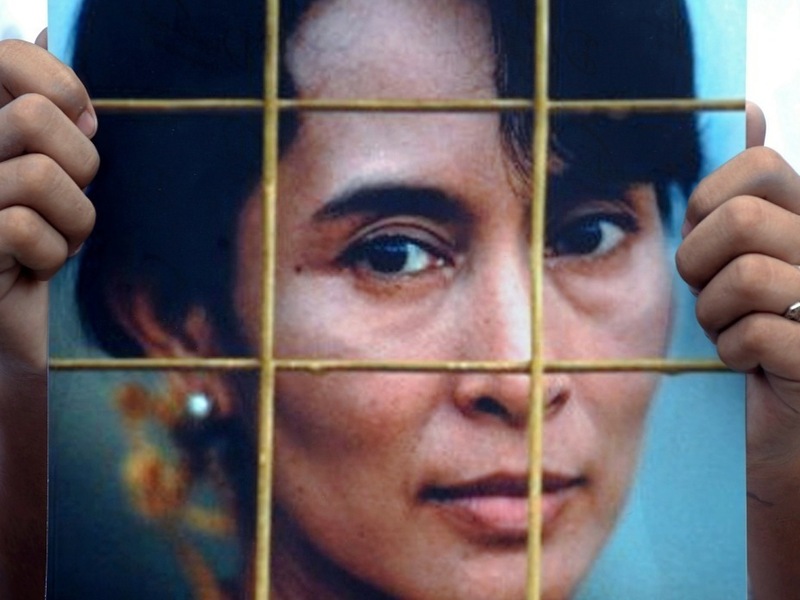 Suu Kyi has been jailed or under house arrest for more than 15 of the last 21 years. While her release elated many -- from ordinary Myanmar citizens to world leaders -- some warned her struggle was far from over. London-based rights group Amnesty International estimates more than 2,200 political prisoners remain jailed by the junta. "While Daw Aung San Suu Kyi's release is certainly welcome, it only marks the end of an unfair sentence that was illegally extended, and is by no means a concession on the part of the authorities," said Amnesty's Secretary-General Salil Shetty. "The fact remains that authorities should never have arrested her or the many other prisoners of conscience in Burma in the first place, locking them out of the political process." The release of one of the world's most prominent political prisoners came a week after an election that was swept by the military's proxy political party and decried by Western nations as a sham designed to perpetuate authoritarian control. A protester in Bangkok demonstrates for Suu Kyi's release in 2009. Supporters had been waiting most of the day near her residence and the headquarters of her party. Mya Kyi, a 65-year-old housewife with tears rolling down her face, said she had waited anxiously since the morning after traveling 25 miles from her home north of Yangon. "Now that I have seen her face, I'm ready to die," she said. Suu Kyi's release was immediately welcomed by world leaders. President Barack Obama called Suu Kyi "a hero of mine" and said the United States "welcomes her long overdue release." "Whether Aung San Suu Kyi is living in the prison of her house, or the prison of her country, does not change the fact that she, and the political opposition she represents, has been systematically silenced, incarcerated, and deprived of any opportunity to engage in political processes," Obama said in a statement. U.N. Secretary-General Ban Ki-moon praised Suu Kyi upon her release. "Her dignity and courage in the face of injustice have been an inspiration to many people around the world," he said. British Prime Minister David Cameron said her freedom was long overdue. "Aung San Suu Kyi is an inspiration for all of us who believe in freedom of speech, democracy and human rights," he said. Suu Kyi, seen here in 1998, has come to symbolize the struggle for democracy in Myanmar. In a rare mention of the opposition leader, state television announced Saturday night that national police chief Maj. Gen. Khin Yee visited Suu Kyi at 5 p.m. to read the official release order. Khin Yee said he was happy to see Suu Kyi in good health, and that the authorities were ready to provide any assistance she needs, the report said. The police chief told her authorities want to maintain the rule of law, peace, stability and tranquility, and Suu Kyi replied "she feels the same way, too," it said. Critics say the Nov. 7 elections were manipulated to give the pro-military party a sweeping victory. Results have been released piecemeal and already have given the junta-backed Union Solidarity and Development Party a majority in both houses of Parliament. The last elections in 1990 were won overwhelmingly by Suu Kyi's National League for Democracy party, but the military refused to hand over power and instead clamped down on opponents. Suu Kyi's release gives the junta some ammunition against critics of the election and the government's human rights record, which includes the continued detention of thousands of political prisoners and brutal military campaigns against ethnic minorities. It is unlikely the ruling generals will allow Suu Kyi, who drew huge crowds of supporters during her few periods of freedom, to actively and publicly pursue her goal of bringing democracy to Myanmar, formerly known as Burma. But some see hope in her release. "There is no formal opposition [in Myanmar] so her release is going to represent an opportunity to re-energize and reorganize this opposition. So in that sense, of revitalizing the opposition in some concrete way, Suu Kyi's release is going to be very pivotal," said Maung Zarni, an exiled dissident and Myanmar research fellow at the London School of Economics. Suu Kyi was convicted last year of violating the terms of her previous detention by briefly sheltering an American man who swam uninvited to her lakeside home, extending a period of continuous detention that began in 2003 after her motorcade was ambushed in northern Myanmar by a government-backed mob. Suu Kyi has shown her mettle time and again since taking up the democracy struggle in 1988. Having spent much of her life abroad, she returned home to take care of her ailing mother just as mass demonstrations were breaking out against 25 years of military rule. 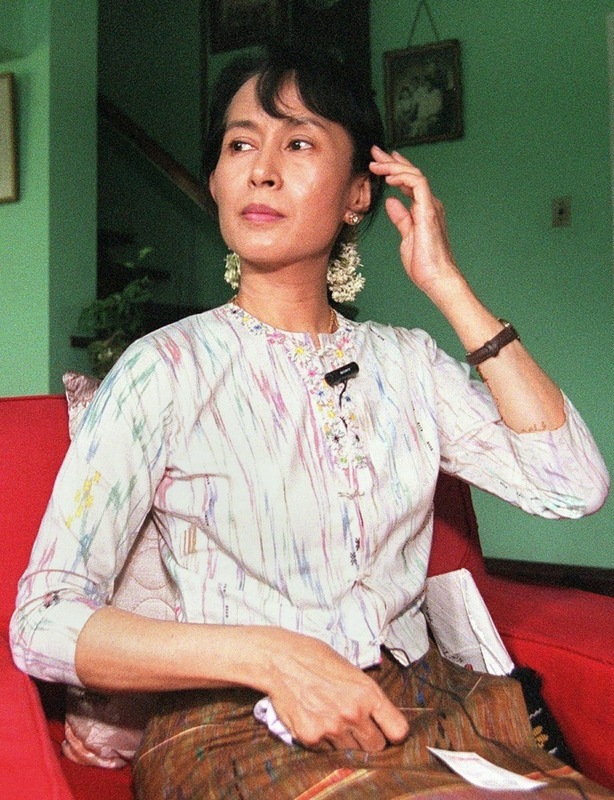 She was quickly thrust into a leadership role, mainly because she was the daughter of Aung San, who led Myanmar to independence from Britain before his assassination by political rivals. Charismatic, tireless and outspoken, she rode out the military's bloody suppression of street demonstrations to help found the NLD. Her defiance gained her fame and honor, most notably the 1991 Nobel Peace Prize. Her popularity threatened the country's new military rulers. In 1989, she was detained on trumped-up national security charges and put under house arrest. She was not released until 1995 and has spent various periods in detention since then. 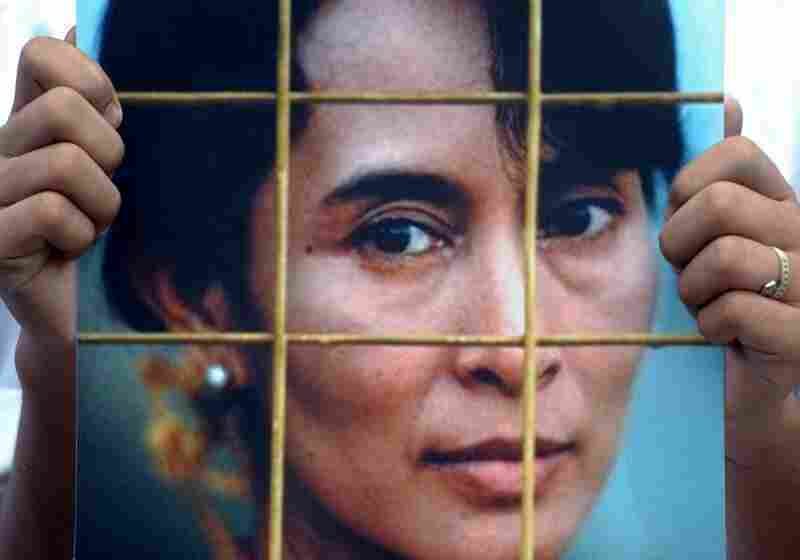 Suu Kyi's freedom had been a key demand of Western nations and groups critical of the military regime's poor human rights record. The military government, seeking to burnish its international image, had responded previously by offering to talk with her, only to later shy away from serious negotiations. Suu Kyi -- who was barred from running in this month's elections -- plans to help probe allegations of voting fraud, according to Nyan Win, a spokesman for her party, which was officially disbanded for refusing to reregister for this year's polls. Such action, which could embarrass the junta, poses the sort of challenge the military has reacted to in the past by detaining Suu Kyi. Awaiting her release in neighboring Thailand was the younger of her two sons, Kim Aris, who is seeking the chance to see his mother for the first time in 10 years. Aris lives in Britain and has been repeatedly denied visas. Her late husband, British scholar Michael Aris, raised their sons in England. Their eldest son, Alexander Aris, accepted the Nobel Peace Prize on his mother's behalf in 1991 and reportedly lives in the United States. Michael Aris died of cancer in 1999 at age 53 after having been denied visas to see his wife for the three years before his death. Suu Kyi could have left Myanmar to see her family but decided not to, fearing the junta would not allow her back in. NPR's Anthony Khun contributed to this report, which contains material from The Associated Press.